Hump Day for some is Happy Day for me! Woman Crush Wednesday number 66 and I am so excited to share this fabulous female chef with you. Some of you may know her already, but if you don’t you can thank me now. Olia Hercules is originally from the Ukraine, but lives and works here in London. About ready to launch her second cookery book, this gorgeous gourmet gal is flying with her innovative recipes! And today I will be recreating one of them live on my Snapchat (username blissbakery) and sharing the LOVE with her on here too! Olia moved to the U.K in 2002 at 18 years old for university. She only switched to a new life as a chef in 2008 when she attended the prestigious Leith’s culinary school in London. After working with some of the best food businesses around, such as my fav Ottolenghi, she published her first book. 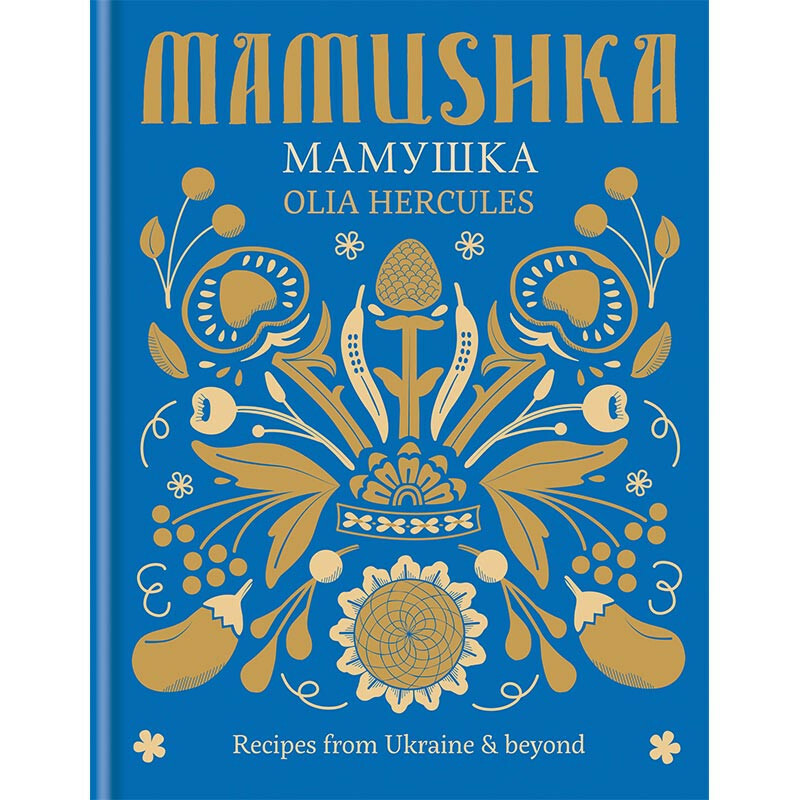 Mamushka is an ode to her homeland, but also highlights the fact that Olia is a food explorer. 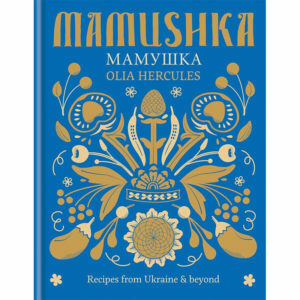 She incorporates many traditional elements for other cultures into her cooking. 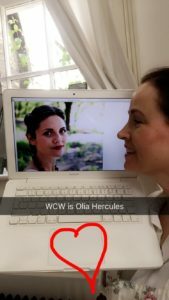 As a food writer, and food stylist, her eclectic essence makes her unique among her peers. I love what she is doing in the culinary world! She says she isn’t a vegetarian but can’t live without vegetables. That literally sounds like what I say all the time. I crave vegetables and adore salads! It has been so warm in London and I have been making salads every night for dinner. But I always have to jazz them up to get Hubby to eat them since he’s not the biggest salad fan. 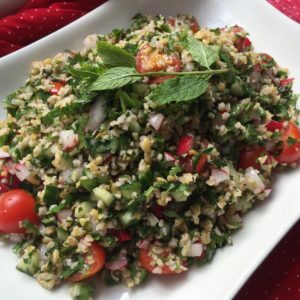 So I am going to give Olia’s Tabbouleh recipes a go. It looks like it is packed with healthy bits and pieces and is definitely a spin on the standard recipe. Instead of the traditional bulgur wheat, Olia uses freekeh, a young green wheat which has been cracked and toasted. 1. Cook the freekeh in lots of boiling salted water for 15-20 minutes. It should still have a little bit of a bite. 2. Mix the lemon, salt and sugar, let them dissolve and add the olive oil. When the freekeh is ready stir the lemon mixture through the freekeh and let it cool. 3. Mix the rest of the ingredients and stir the cool freekeh and tomato juices through. Adjust the seasoning to taste and add more lemon juice and olive oil if the salad needs it. That’s it! 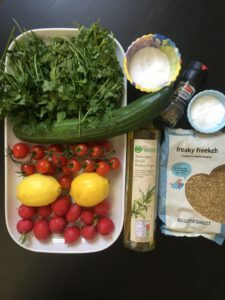 A super easy, quick and healthy recipe perfect for this summer heat. It can be adapted for people adverse to cilantro/corriander. Just add more parsley! And for those who prefer pomegranate seeds, they can be swapped out for the cherry tomatoes. It is a nice salad that holds up, versus a mixed leaf salad that once it is dressed needs to be eaten immediately. And for non vegetarians, this could be served as a side with a roasted lamb or chicken or grilled fish. 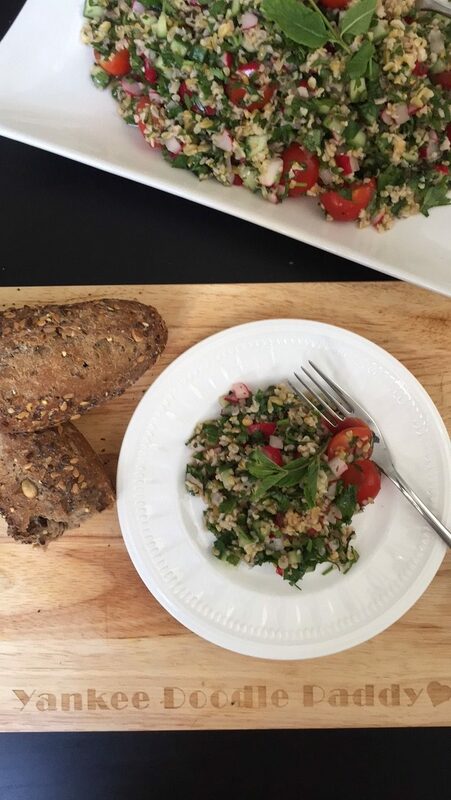 I enjoyed mine with some crusty rye seeded bread! 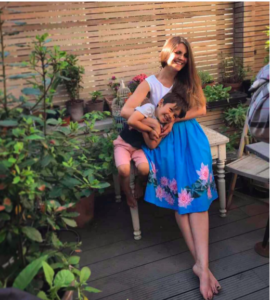 Olia is a mommy and has shared that she has fed her son the same food that she eats. No baby puree at all. So his palate is very advance compared to most five year olds. But with her talents as a chef I can see why he loves the taste of her food. And she makes it look so fantabulous. This is why I enjoy her Instagram account, the photos are a combination of realistic and ethereal. Like nothing else out there. 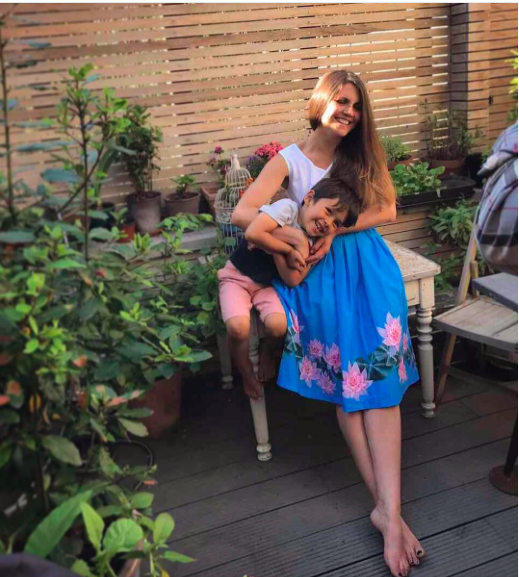 And the occasional photos of her and her son are so precious! Since it was only recently, I will say a Happy birthday to you Olia! I hope the next 33 are just as successful, happy, adventurous and filled with love as the first 33 have been. Thanks for being such an inspiration to so many in the foodie world. Your awards for the first book are only a start. Looking forward to seeing the accolades for Kaukasis!